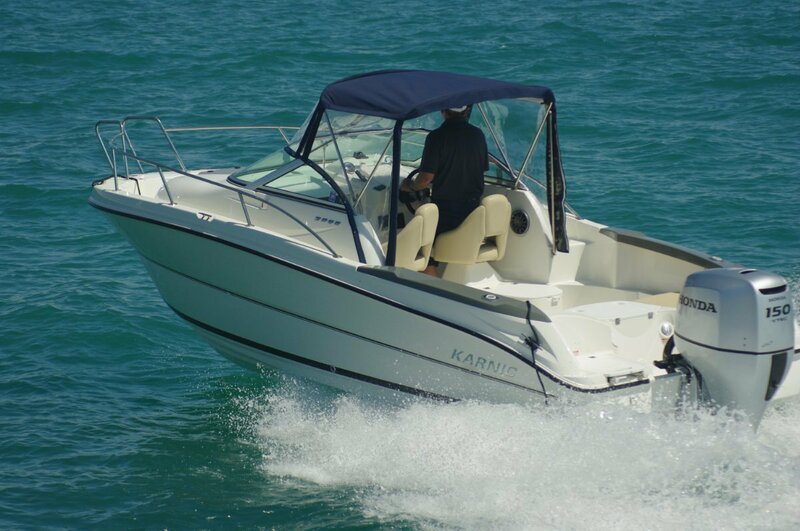 The Karnic 2050 is very much a part of a family of fibreglass boats; the hull design and proportions are closely related throughout the range. All share the pleasant feature of value for money. The 2050 is one of the bigger sisters and is less of a Lego boat than its juniors. No disrespect there: the ability to add or delete components to suit the owner’s needs is handy. But this one is very much a complete package. It even has a Bimini, an item specially made for the Australian market. The importers actually had to show the Cypriot builder what such a thing was – an unheard of frivolity in the Mediterranean. The layout is walk around with an emphasis on giving the cockpit the lion’s share of overall length. The main element in achieving this was the usual one of pushing the mid cabin most of the way to the stem. Karnic provided a nice balance between deck width for access forward and room within the cabin. The result is a usefully roomy cabin with usable bunks, closed off by a solid door and a clear fore hatch. One of the common reasons for visiting the foredeck is to anchor. Here is another area where European boating practice is different to Australian: no bowsprit or heavy duty hardware for the job. All is fixable with aftermarket items, but something to consider when assessing overall value. And the price is attractive: $60,000 on a good trailer with a 150 Honda on the back. A crawl through the 2050 reveals some otherwise hidden features. All colour coded wiring is a good start, and all compartments below the deck being self draining is a good follow up. The builder made access to everything a priority, with the fuel tank being an example. Inevitably, one day it will need to be inspected; this one is in durable polycarbonate. One observation: at 90 litres it is small by local standards for a 150hp motor. Seats for seven are provided. So long as some of them were children that is about as many as would be comfortable for day cruising. The two main seats are thoroughly up market bucket-style armchair swivels with room between them for access to the cabin; something walk arounds do not always have. The steerage accommodation is acceptable: jump seats on the locker bases of the main seats, a pair of removable quarter seats and a central rear seat that lifts to reveal a sink. This is fed from a 45 litre fresh water tank. Shelter is good for those in the first class seats, the Bimini and clears creating a virtual backless wheelhouse (once told, the lads in Cyprus did a good job). The occupants have the benefit of an effective stereo system – standard in the full Karnic range. With the quarter seats stowed in the cabin there is total rail access and plenty of elbow room. The walk around layout allows fishermen to spread widely; prized perches will be on the rounded top of the cabin. Good guard rails make this a secure as well as comfortable spot. There is a reassuring lack of twitchiness with people movement around the Karnic; just what you want in a fishing boat. This stability does not come at a cost in ride quality. The hull has a moderately sharp deadrise of 18 degrees and curves in the right places that do a fine cushioning job. The abundant Honda torque meant the power trim worked well with the smallest of leg movement to tune the hull’s trim.